Heat oven to 375°F. 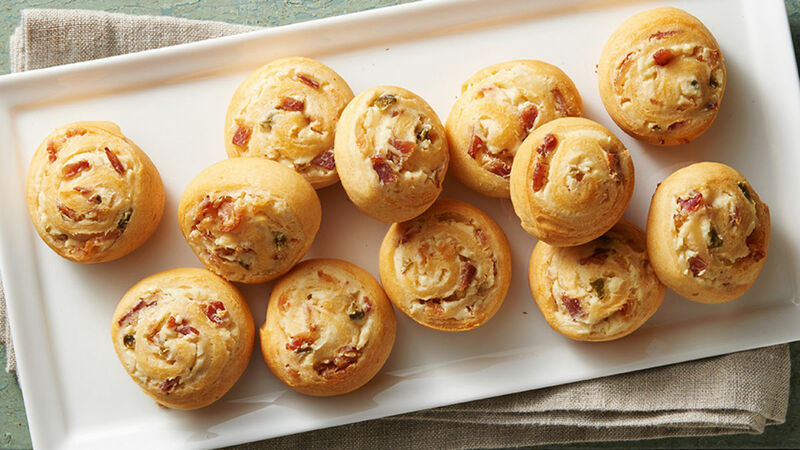 In small bowl, mix cream cheese and bacon until well blended; set aside. Unroll crescent dough; separate into 4 (4x6-inch) rectangles, pressing perforations to seal. Spread cream cheese mixture on each of the dough rectangles to within 1/2 inch of edges. Starting with 1 short side, roll up rectangle; press seam to seal. Cut roll into 6 slices, and place slices cut side down on ungreased large cookie sheet. Repeat with remaining dough rectangles. Bake 15 to 17 minutes or until light golden brown. Immediately remove from cookie sheet. Serve warm. Cook bacon ahead to save time, or buy precooked bacon, which can be found in the refrigerated section of the grocery store. Jalapeño cream cheese spread can be found in the cream cheese section of the grocery store. If you have trouble finding it, substitute 6 oz regular cream cheese mixed with 2 teaspoons seeded and diced jalapeños.